A driver "nudged" her car into a pram carrying a nine-month-old baby to push it off a pedestrian crossing, a court heard. 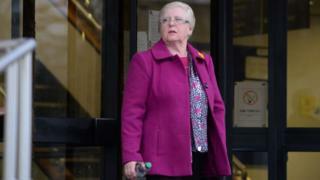 Joyce Jenkins, 73, is accused of using her car in a "ridiculously dangerous" attempt to get the pram off the crossing in Carmarthen Road, Swansea, last April. Keranne Jones, 26, said as she crossed the road the car edged forward and caused her pram to swing around. Ms Jenkins denies dangerous driving. Ms Jones said Ms Jenkins had been "pointing" at the lights changing as she moved her car forward. "She had no intention of stopping," she said. "It was just to get through those lights whether we were there or not." Ms Jones said the pedestrian lights were on green when she began to cross but began to flash when she was halfway across the two lanes. Another motorist, Judy Williams, said Ms Jenkins was waving her arms and shouting angrily. "It was distressing... The lady continued to drive until she made contact with the pram. "It was ridiculously dangerous. I thought the pram may tip over. She kept edging and edging forward. As she kept edging the pram swung away from the car." The court heard great-grandmother Jenkins, of Mayhill, Swansea, had never received a fine in 42 years of driving. She denied driving towards the pram and claimed to have "immediately stopped" when she saw Ms Jones with the pram. Ms Jenkins said: "When the lights changed to green I started to move forward. "I saw a lady with a baby on my near side front of my car so I immediately stopped. "She was was angry but I could not hear what she was saying because my window was closed. "I was just shocked and a bit angry. "I thought she was very silly to come onto the road with a baby in a pram when her lights must have been against her."